Often repeated type. A principle so often employed for the production of self-moving machines that it ranks next to that of perpetual eccentric weights in its delusive power upon the minds of inventors. 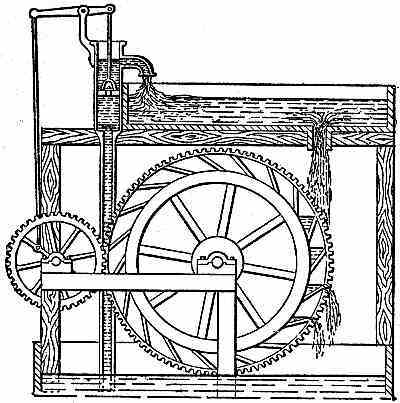 The attempt to compel a water wheel to raise the water which drives it is in one form or other perpetually recurring in devices upon which our counsel and opinion are sought. The worst of the matter is that in most cases our advice to drop such absurd projects is received as evidence of want of sagacity and knowledge, and our would-be client becomes the dupe of some not over-conscientious patent agent, who pockets his fees and laughs in his sleeve at the greenness of the applicant. The device illustrated is one submitted by one of those enthusiastic individuals, who, without understanding the first principles of mechanics, believes he is about to revolutionize the industry of the world by his grand discovery; and as honor, and not pecuniary reward, is his object, he seeks to make public his invention through the wide circulation of some journal. He is quite willing we should adversely criticise the device, because its merits are so great that no amount of skepticism resulting from our blind prejudice can, he thinks, influence candid minds against a principle so obviously sound and sublimely simple.